Video clip synopsis – Federation was a time of jobs and opportunities. With our 12,000 mile coast Australia needed a defence force. Broadband MP4 defend_bb.mp4 (7.7MB), suitable for iPods and computer downloads. 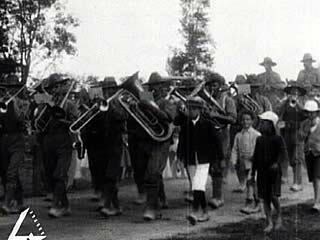 Federation and Defending Our Shores is an excerpt from the film Cavalcade of Australia 1901-1951 (34 mins), produced in 1951. Reading standard: Students will read, view, analyse and discuss a wide range of informative and persuasive texts and identify the multiple purposes for which texts are created. They explain how texts are shaped by time, place and cultural setting in which they are created. Writing standard: Students compose a range of other texts, such as feature articles, web pages and workplace texts. Speaking and listening standard: Students, when engaged in discussion, they compare ideas, build on others’ ideas, provide and justify other points of view, and reach conclusions that take into account of aspects of an issue. Before 1901 Australia was a collection of separate colonies. Each was part of the British Empire, but they were not formally linked together, other than by being on the same area of land and all being British colonies. Federation changed that. The Federation process of the 1890s resulted in the creation of a new nation, Australia, by the voluntary joining together of the six separate colonies. Each colony gave up some of its powers to the new national parliament, though each remained tied to Britain, as did the new Commonwealth of Australia. In 1909 the British military leader Kitchener was brought to Australia to make recommendations about the nature of the new national defence forces and his report led to the creation of the system that would be in place when Australia entered World War 1 in 1914. In considering why Federation occurred, historians are always conscious of the role of defence. They disagree, however, about how significant a force the need to come together for defence purposes was in breaking down the separate colonies’ reservations about creating the new nation. Was it a major motivation? Or was it one of a number of factors that helped create a climate in which Federation was more likely to occur? In 1901 Australia became a new ‘nation’. Write a 100-word explanation of what that means and how it relates to you. Why, according to the video clip, were people at the time so anxious about defence — why did they think it was needed and was important? Construct a detailed list of images used in the video clip then divide them into images that show Australian progress and images that reflect Australian fear of invasion. The main message of the video clip is the fear of invasion. This video clip, though it shows footage from the early 1900s, was made in 1951 — only nine years after enemy forces had bombed various parts of Australia and had looked like they might invade. Discuss how this awareness of the vulnerability of Australia to being attacked might influence the message and construction of the video clip. Imagine that you have been asked by a pro-Federation group in 1890 to design a poster that will focus on national defence as a reason for federating the six existing colonies into the new nation, Australia. Your audience is the Australian public in 1890. Use the information and images in the video clip to create your poster. It must include at least 300 words of text.